Use Vertical Badge Buddy for credit card and data collection size badges. Badge Buddy slotted inserts are 2-up per a sheet and can be ink-jet or laser printed. Customize your own custom Badge Buddy using Microsoft Word. Note: Laminator must be a heavy duty laminator capable of high heat and pressure. 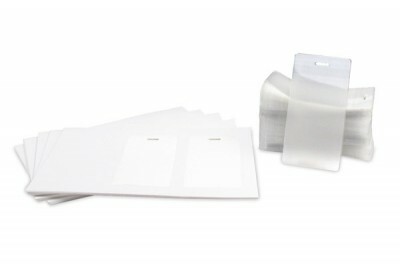 Laminators made for business cards or paper cards are not suitable.